Every Friday, Horse Nation teams up with Ovation Riding to spotlight an individual or organization doing good work in the horse world. Today, we recognize Luis Soriano and his two donkeys, who make up Biblioburro. When you imagine the phrase “a hero rides into town,” you probably picture the good-guy cowboy or sheriff, or a brave knight from days of old. 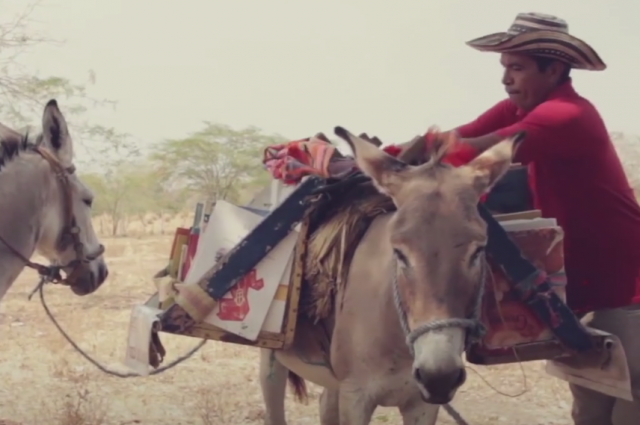 One would probably not imagine a man astride his humble donkey with another ponied off behind, laden with a pack saddle full of books — but that’s Luis Soriano and his donkeys, a mobile library in rural Colombia that’s served the community for twenty years. Now dubbed “Alfa” and “Beto” (together forming alfabeto), the donkeys carry Soriano’s book collection to schools and homes to help spread literacy and foster learning. As Soriano describes, he is “sowing the seeds” of education among the community, broadening horizons and encouraging imagination among young students as they delve into the worlds created in books.
? Along with his two loyal donkeys, Luis Soriano has been spreading the joy of reading to children in rural Colombia for over 20 years. Soriano’s efforts have spread, and other similar donkey-powered libraries are making inroads into other local communities. The work is tiring and can be sometimes dangerous, with a single rural school community spread out over the span of a four-hour journey. The biblioburro continues to provide an important service, however, with students eagerly flocking around the donkeys to choose their next title. If you know someone who deserves a Standing Ovation, we would love to recognize them in a future post. Email the name of the person or organization along with a message about the good work they do to [email protected]. Photos/videos are always welcome, and include a link to their website if applicable.